On-pavement signing shows a curve sign or other pavement marking symbol (such as the speed limit) in advance of a curve or other problem location. Use of wording or signing on the pavement surface is more dramatic than vertical signing, which can get lost in the clutter of a streetscape. However, on-pavement signing has not been widely used in Iowa to address lane departures. 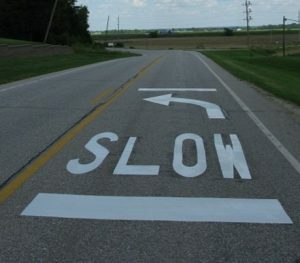 One study evaluated the use of on-pavement signing consisting of the word SLOW with a curve arrow framed between two horizontal bars. The treatment was applied along two curves. Both mean and 85th percentile speeds were reduced by around 1 mph (Hallmark et al. 2012). No information is available about the crash impacts of on-pavement marking legends. 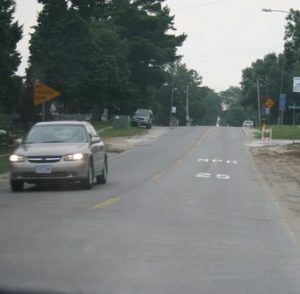 More information is provided in this technical brief, On-Pavement Signing (PDF), which summarizes information about pavement marking legends relevant to Iowa. Hallmark, Shauna, Neal Hawkins, and Omar Smadi. Evaluation of Low-Cost Treatments on Rural Two-Lane Curves. Center for Transportation Research and Education, Iowa State University, 2012. Development of this website was financed in part through funds provided by the Iowa Department of Transportation and Federal Highway Administration state planning and research funding. The contents of this website reflect the views of the authors, who are responsible for the facts and the accuracy of the information presented herein. The opinions, findings and conclusions expressed in this website are those of the authors and not necessarily those of the sponsors. The sponsors assume no liability for the contents or use of the information contained in this website. This website does not constitute a standard, specification, or regulation. The sponsors do not endorse products or manufacturers. Trademarks or manufacturers’ names appear on this website only because they are considered essential to the website’s objective.